The work details how the susceptibility gene is associated with increased expression of the protein BNC2, which is in turn regulated by another protein called YY1. The discovery began with a genome-wide association study using more than ten thousand volunteers with and without scoliosis. This type of study looks for small differences in genes—called single nucleotide polymorphisms, or SNPs—that occur more frequently in people with a certain disease. After confirming the association between a particular SNP (pronounced “snip”) in two additional independent populations—one in Japan and one in China—they determined that it is located near the part of the DNA that codes for the protein BNC2. The team tested this hypothesis and found that not only was BNC2 expression triggered by the protein YY1—which binds to the DNA around the SNP—but that for genes with the at-risk SNP variant, the amount of BNC2 produced when YY1 was present was much greater than for genes with the non-risk variant. The BNC2 gene is highly conserved across diverse species, and plays roles in a variety of tissues. 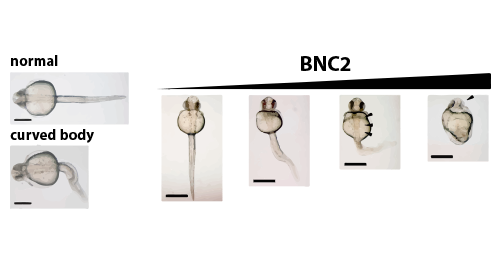 To test how over-expression of BNC2 affects development, the team expressed it in zebrafish embryos and found that it resulted in severe body curvature that was positively correlated to the amount of BNC2. These results and the abundance of BNC2 in the human spine and bones make it likely that adolescents with the disease-associated SNP variant may begin to produce excess BNC2 at puberty if other genetic or environmental factors are also present.